Meet Danny, our new development chef at Create. Before getting into development I opened my own restaurant in Dalston called White Rabbit which Alain Ducasse featured in his book “J’aime London”, set up a burger pop-up called Psychic Burger and worked with Sailor Jerry, creating dishes using their products. I then went on to become the Head Development Chef at Food Innovation Solutions working with all kinds of food businesses, from start-ups, to established high street names, manufacturers and retail. In his role as Development Chef Danny will bring the creativity, passion and vision to our chef team and provide further inspiration for clients’ bespoke events. 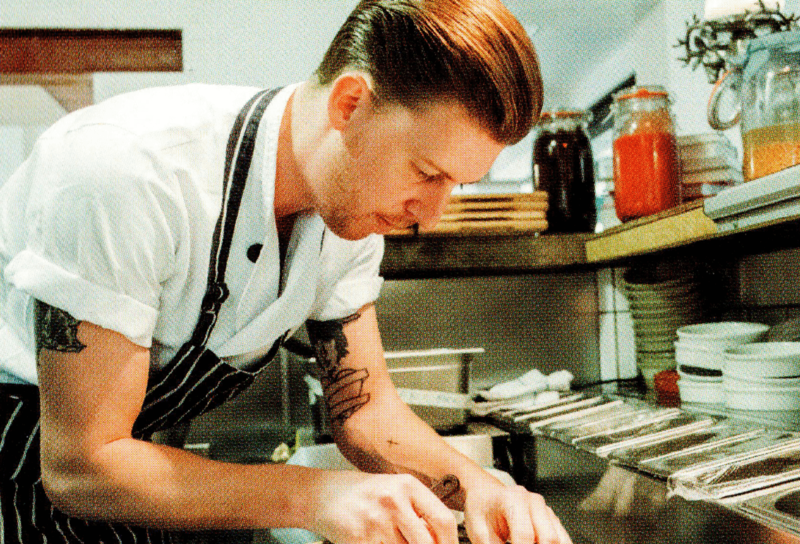 We caught up with him at the Create kitchens to find out a bit more. How did you first get into being a chef? I grew up working in kitchens and on building sites as a teenager, then decided I wanted to be a photographer, studying photography at art college and then St Martin’s School of Art. However, I find the kitchen is where I feel most comfortable as it has the camaraderie of building sites and the creativity of photography. It is impossible to give you my favourite dish, I’m constantly concentrating on pushing forward and evolving things that I have already come up with. Right this very second I’m thinking about rabbit flanks and how best to utilise them. It’s fluid. What’s the strangest request you’ve received? At my first Head Chef Job at The Bathhouse in Liverpool Street, a lady who was dining with us handed me a business card which stated all of her dietary requirements. The list was extensive and included dairy, chocolate and nuts as things she could not eat. She was very animated about her requirements and lectured us on how important they were. This was fine as I would always want a customer to enjoy their experience. She came back to the kitchen after her main course and thanked the kitchen for such a lovely meal. She then sat down and ate the chocolate tart which contained dairy and was garnished with nuts! What would you pick as your last meal? It would be a feast with many different elements, including fried chicken, lasagna and peanut butter. And finally, where is your favourite place to eat in London? At the moment I really like Berber & Q in Haggerston. Can you share any cooking tips with us? Clean kitchen, dirty mind and the rest will follow. Look out for plenty of exciting new dishes from Danny and the team!